People love to see, interact and experience technology. An app in a housebuilder’s marketing suite or sales centre is a great way to increase customer engagement and enhance the home buying experience. We have recently created an app for our property developer client Urban Rhythm, at their landmark Leicester City development, Wheatsheaf Works. 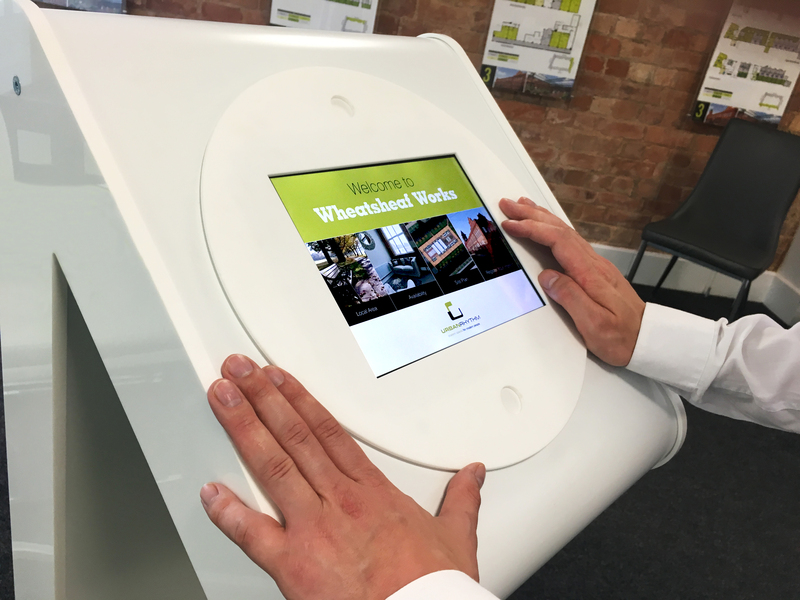 We manufactured a custom branded podium to incorporate the app which is delivered to the user through an iPad. The slick, easy to use app, acts as a silent salesman and is a great way to keep the customer engaged if the sales adviser is busy. In addition to proving a useful sales and marketing tool, it also adds to the aesthetics and overall design of the sales centre. The app shows information about the development, local amenities, as well as house type details and current availability and incentives. Importantly the app integrates with the homebuilder’s website and any changes to prices and house type availability are also reflected simultaneously on the iPad, allowing for effortless updating and next to no maintenance. While the app doesn’t replace a traditional brochure, it boosts the home buying experience and sits well with other on-site marketing material.